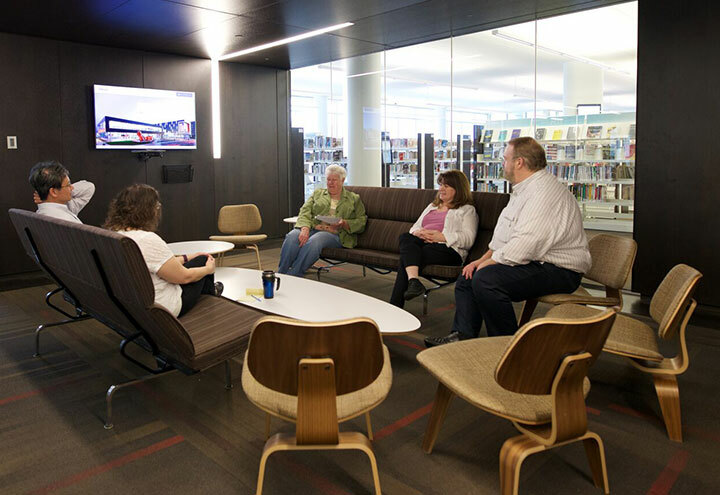 At the Cedar Rapids Public Library we believe that a vibrant community needs free public space for meetings, programs, training sessions, and events. In addition, we welcome you to celebrate your special day or event at the downtown Cedar Rapids Public Library! Our Library is a destination in our downtown, located across the street from Greene Square Park and within walking distance to several restaurants, theaters and the US Cellular Center. The rooms are available to reserve up to 90 days in advance. Any meeting or event scheduled before/after regular library hours or where a fee is being charged to attend and/or items or services are offered for sale is subject to a fee. Fundraising of any kind at the Library will be subject to a room fee, regardless of non-profit status. When you are ready to book your meeting or event, please click the link below. 1) When you arrive at the Library, ask a staff member to unlock the room for you. When you are done, ask a staff member to lock the room. 2) Return the room to its original setup when you’re done. Your reservation should include set up before and clean up after. We provide a vacuum cleaner and trash cans for you. The room may be booked for someone else immediately after you, so it should be clean and ready for them to use. A cleaning fee may be charged to groups who do not thoroughly return the space to its original setup. 3) Room capacities are set by fire code and must be observed. Book the right size room for the number of people you expect. 4) Smoking is prohibited in the Library and on the Library property. 5) Deliberate misuse of or damage to library meeting rooms or equipment may result in billing the user for damages and/or refusing any further requests for meeting room use. Items like frosting left smashed into furniture or the carpet can constitute damage and may result in a charge. Please clean up your messes so we can offer a nice space for all to use. 6) The library is not responsible for loss or damage to the private property of individuals or organizations using meeting facilities. Beverages may be served in connection with an event. No beverages may be taken outside the designated event location. Alcoholic beverages cannot leave the premises. Alcohol is allowed at special events following approval from the Board of Trustees and through the use of a licensed caterer only. A special event application must be completed and processed through the Board of Trustees. Applications must be submitted no less than 60 days prior to an event for consideration. The Board of Trustees meet monthly, typically the first Thursday of each month. The consumption of alcoholic beverages falls under the Board’s Special Event Alcohol Use Policy (Board Policy 3.08). All guidelines therein must also be followed. Food is allowed to be brought in and consumed for personal use. Potluck or food made at home is also allowed. However, any food in the Downtown Library, store-bought or purchased from a caterer, brought in to be consumed by a group with one paying individual, organization or company (so any event which provides food to attendees) must be purchased through the Greyhound Cafe located within the library. To use the caterer of your choice, you must pay a $2 per person fee, up to $250, to Greyhound Café. There is no outside vending allowed on Library premises. Food is not allowed in the Technology Learning Center. All set up and load-in for events must be coordinated as a part of your rental time. No items may be delivered or stored at the Library without prior approval. All vendors such as caterers, DJ’s and rental companies must coordinate entrance into Library spaces as part of your rental time. No vendor will be allowed into the Library earlier than the planned rental time. You are responsible for ensuring that someone is on site at all times during load-in and who is responsible for all activities and has full authority to make any necessary decisions. It is your responsibility to communicate this with your vendors. All clean up and load-out for meeting or event must take place during the rental time. No items may be left at the Library without prior approval. All vendors must be out of the building completely by the end of the rental period. If an event is not concluded by the end of the agreed upon reservation time, including all clean up and all vendors out of the building, then a fee of double the hourly reservation fee will be incurred per hour for the overtime, with a minimum charge of $200. It is your responsibility to communicate this with your vendors. The setup of your rental’s location(s) must be returned to the standard configuration. All equipment entering the building is subject to the Library’s approval. A list of all equipment must be given to the Community Relations Staff for approval at least seven days prior to the event. All equipment must be removed immediately following the meeting or event. The Library does not provide lifts, ladders, extension cords or any other equipment. The Library must coordinate any necessary sound or A/V equipment needs with you prior to your event, including scheduling any rehearsal time. Any additional lighting must be approved prior to the wedding with the Community Relations Department at least two weeks prior to the wedding. Décor must not mar or affect the Library appearance and must be removed immediately following the wedding. No materials, lighting, adhesives or any physical structures should touch the walls, ceiling, light fixtures or any part of the façade or interior of the building – at any time, for any reason. No open flame is permitted. No artificial smoke machines are allowed in the building. No fireworks of any kind or sparklers are permitted inside the building. Our logo cannot be used on your promotional materials without permission. When you are promoting your event, do not use the Library’s telephone number as your organization’s contact point. It’s better for your customers if you provide an independent address, telephone number and/or website that people can go to for more information. On rare occasions, we may need to shift which room you use in order to accommodate another group. If this happens, we will do our best to notify you as soon as possible and make the transition smooth. The library reserves the right to take photographs of any wedding or event for its own records and for future promotional materials. Library programs and events take precedence over any other use of civic space. The library may cancel a reservation or change room assignments for library business. Users may be required to submit evidence that the User is covered by general liability and workers compensation insurance satisfactory to the Library and that the City of Cedar Rapids, the Cedar Rapids Public Library and their trustees, officers and employees have been named as additional insureds with regard to the use of its meeting room. Such coverage shall be required when the User will serve or sell alcoholic beverages in connection with the event, when the event will be held outside regular library hours, or when, in the judgment of the Library, special circumstances exist in connection with the event. The general liability coverage must be in the general aggregate of not less than $1 million and the workers compensation and employers’ liability coverage must be in the amount of at least $100,000 for injury and $500,000 for disease. If the Library permits alcoholic beverages to be served, but not sold, in connection with the meeting or event, the general liability insurance coverage must include host liquor liability coverage. If the Library permits alcoholic beverages to be sold in connection with the event, the User shall obtain at its own expense liquor liability insurance coverage in addition to the general liability coverage, in an amount not less than $500,000 for each common cause and not less than $500,000 as an aggregate limit. If in the judgment of the Library there are special circumstances warranting greater insurance coverage than aforesaid, the outside organization shall obtain such coverage as the Library requires. Required insurance certificates must be obtained and submitted to the Library not less than 96 hours prior to the scheduled wedding, event or meeting. The User shall indemnify, defend, and hold harmless, the City of Cedar Rapids, the Cedar Rapids Public Library and their trustees, officers and staff for any claims arising out the User’s use of the facilities. Violation of these rules may result in cancellation of the reservation or the meeting and/or denial of future use of the facilities. The Library reserves the right to amend, add to, modify or delete any of the provisions of this policy at any time, with or without prior notice. The Board of Trustees sets policy for the Library. disapproves of any particular program or its content. 1. Food is allowed in all meeting rooms except the Technology Classroom. 2. Room capacities must be observed. 3. Rooms must be reserved and supervised by adults age 18 or older. evidence that the organization is covered by general liability. user for damages and/or refusing any further requests for meeting room use. cancel a reservation or change room assignments for library business. planning guide is available for special occasion use. Click here to see all policies, including our Meeting Rooms Policy. 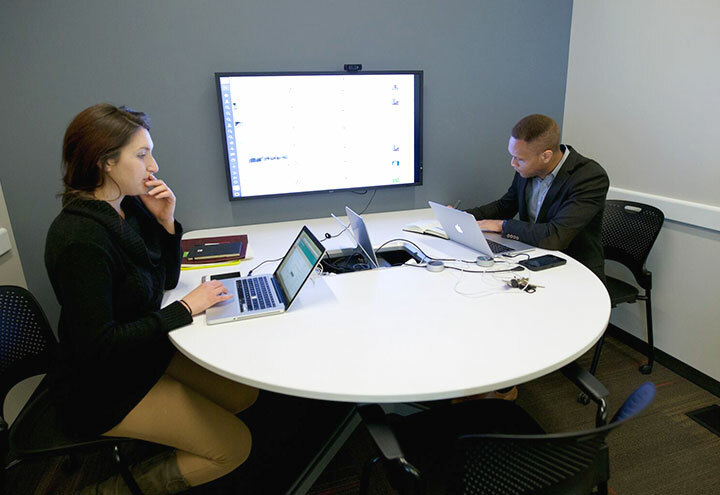 This specially designed conference room comes equipped with a media:scape table, allowing people to connect up to six different devices (computers using HDMI or VGA for collaboration. Connect your device to the appropriate “puck” and when you want your screen to show on the display monitor, tap the puck. This room is ready for you to collaborate and create together. You must bring your own laptop or check one out from the Library to utilize the technology in this room. This nontraditional room is set up for groups to meet in comfortable, soft seating, around coffee tables instead of conference tables. There is a flat screen computer mounted on the wall for use with documents from a flash drive. (please bring your items on a flash drive to use on the computer). Capacity: 16 people; several extra seats around the edge of the room. This traditional Conference Room is set up for meetings around one large table. Extra tables and chairs are in the storage closet in the kitchenette for your use. A data projector and screen are mounted inside the room and always available. 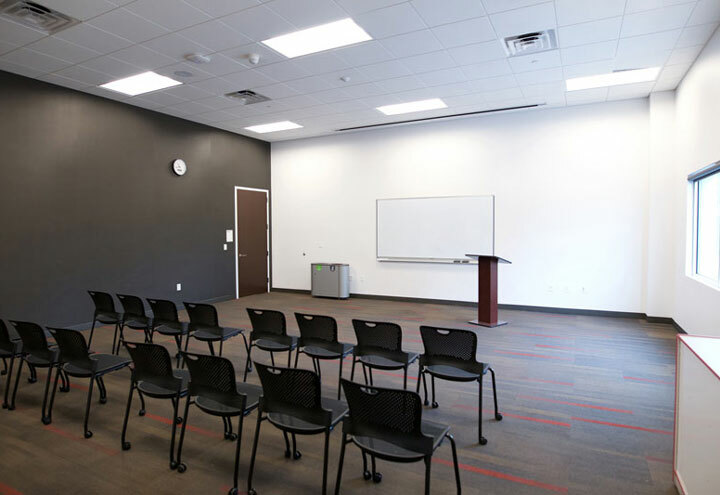 Beems Auditorium features space for up to 150 people in chairs auditorium style, 84 seated classroom style at tables. It can be split into two smaller rooms of 75 each, or 42 people classroom style at tables. Spectacular views and an interactive garden are the highlight of this roof-top space. Up to 150 people can be seated for a reading or a ceremony in the specially designed pathways. 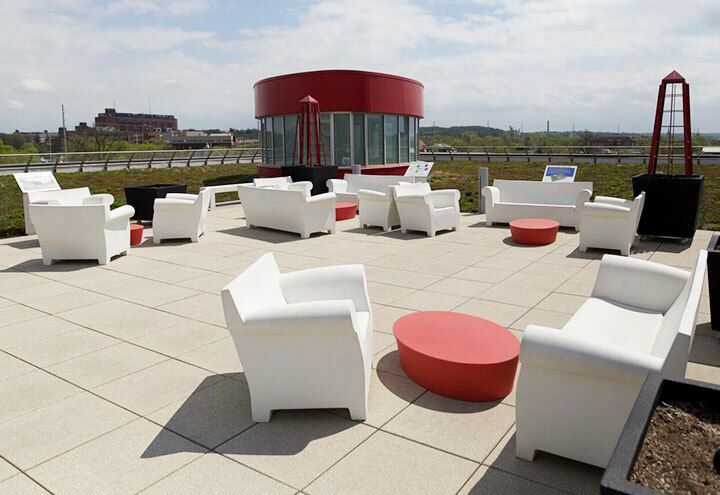 The Library can provide chairs for the LivingLearning Roof but you are welcome to use the furniture provided or bring your own. 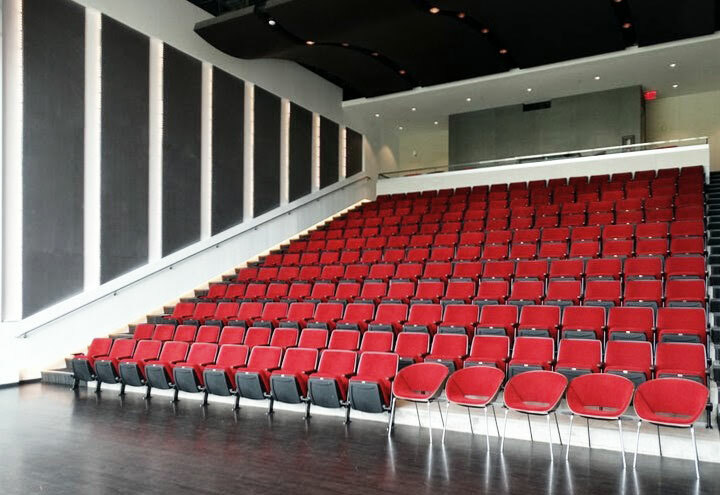 The Whipple Auditorium features spectacular two-story views of Greene Square Park. The auditorium seats up to 200 people in classic theatre style chairs. Whipple can only be booked by speaking with a Library staff member. The User must notify the Library in writing if it becomes necessary to cancel an event. If the event must be postponed due to an emergency situation, the eventmay be rescheduled without penalty on a space available basis, at the discretion of the Library staff. The reservation fee will be transferred to the new booking, if applicable. The Library is not liable for any costs incurred by the User as a result of such cancellation. Cancellations of postponed or rescheduled events will be subject to the cancellation policy. The Library retains sole and exclusive right to revoke or cancel permission to use the facility when the Library deems it necessary, at the Library’s sole discretion. In the event of cancellation by the Library, the Library will provide as much notification as possible and will refund all fees paid or on deposit. The Library specifically does not accept any responsibility for any expenses incurred or losses incurred by the User as a result of any Library cancellation. In keeping with our goal of open access for all, the library does not charge for traditional use of civic space. Library facilities are also available for celebrations and commerce including, but not limited to parties, weddings, and a variety of for-profit activities. We welcome the community to use our spaces and wish to have them in use as much as possible. However, donations to the Cedar Rapids Public Library Foundation, a 501(c) (3) organization, are welcomed and encouraged. A fee may be charged if you are meeting before or after hours. Library staff to setup/teardown Library-owned tables and chairs. Library IT staff to provide IT assistance beyond the initial setup and demonstration of A/V equipment. A cleaning or maintenance fee may be applicable. If you are planning to charge your attendees and/or sell items or services, you must get prior approval from the Library and a fee will be assessed to use the space. Fundraising of any kind will be assessed a room fee to use the space. When a fee for use of a meeting room is applicable, we ask that it be submitted to the Library prior to the event start. Weddings, roof top events, large scale after-hours events and events with alcohol will be charged a $100 nonrefundable reservation fee. The Library knows that every meeting and every group is different. We reserve the right to waive any of the conditions attached to the use of its meeting rooms, including the imposition of fees and charges, on a case-by-case basis. Downtown Library Commons Rental Not available for rent anytime during library hours. $1,200 flat rate for 4 hours. $325 for each extra hour. Up to 100 guests includes 2 staff members. 101 to 200 guests will require 4 staff members for $25 per hour extra. A fee of $100 to have Library staff set up a meeting room space and an additional $100 for clean-up. $75 per hour for an IT staff member to attend your event to assist you with technology needs, such as connecting your equipment to the AV system or setting up sound equipment. A rooftop sound system can be rented for $50; this includes setup and teardown. A minimum charge of $75 per hour may be assessed to the user. Pricing will be rounded up to the nearest whole hour, ie: events running 2 hours and 45 minutes will be charged for three hours. Book your space for the full time you need it, including any time required to set up or clean up. A half hour buffer is automatically set up between reservations and we ask that you adhere to the times you have requested. Every event is unique and the Cedar Rapids Public Library will work with all involved to provide a wonderful experience. If you have an event that requires multiple spaces, please speak to us about a combination cost. If you want an event to happen on a recurring basis, we can do that, but we may have to charge a nominal fee. Fees are subject to change. The Cedar Rapids Public Library has various facilities and meeting rooms that are available for public use at the Downtown Library and a Community Room at the Ladd Library. Fees and rates vary depending on the facility and scope of the event. 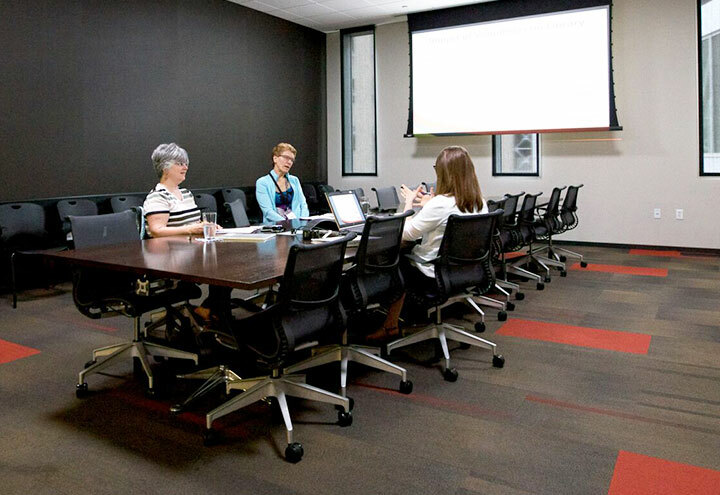 The Library reserves the right to review each prospective use and determine whether that use falls within the meeting room user guidelines. Use of the premises may be terminated at any time if the conduct of the group or any member of the group is disruptive to library service, or in violation of the library’s Behavior Policy. All activities and programs conducted in the library buildings are subject to the general rules and regulations of the Cedar Rapids Public Library. The Library reserves the right to open a space up to the public if a group has not arrived for their space 30 minutes after the reserved time has begun. The Ladd Library has a large lot available for all visitors. The Downtown Library has a non-metered lot located on the south side of the building, which is free for up to two hours. Library card holders receive two hours of free parking at any of the metered spaces surround the library building, around Greene Square, and in the 4th Avenue Parkade. There will be no exceptions made for groups using the library for meeting space; vehicles may not exceed the two hour parking limit for any reason. Event hosts are solely responsible for informing event attendees of the parking garage time limit and availability. The metered spaces surrounding the library building are two-hour spaces only. Spaces around Greene Square and in the 4th Avenue Parkade have a 10-hour limit. A valid library card is required to receive up to two hours of free parking. It takes up to 48 hours after receiving a library card for this feature to activate. Guests are welcome to use the special kiosk located inside the North Vestibule. Parking is free downtown after 6 p.m. and on weekends. The Library does not offer any special parking for special events. Arrangements for special parking can be made directly with Park Cedar Rapids at (319) 365-7275. Can my group reserve a meeting room for multiple meetings? Groups may book a meeting room up to 90 days in advance. May I bring in snacks and coffee? Food is allowed to be brought in and consumed for personal use. Potluck or food made at home is also allowed. However, any food in the Downtown Library, store-bought or purchased from a caterer, brought in to be consumed by a group with one paying individual, organization or company (so any meeting which provides food to attendees) must be purchased through the Greyhound Cafe located within the library. To use the caterer of your choice, you must pay a $2 per person fee, up to $250, to Greyhound Café. May I bring in my own alcoholic beverages for my meeting? No. The consumption of alcoholic beverages falls under the special event criteria and requires Library Board of Trustees approval, and additional costs and insurance. Please refer to the Special Event information on our website, or call 319-261-7323 and ask for a Community Relations team member. What A/V equipment and services does the library provide? The library has some A/V equipment available for use. 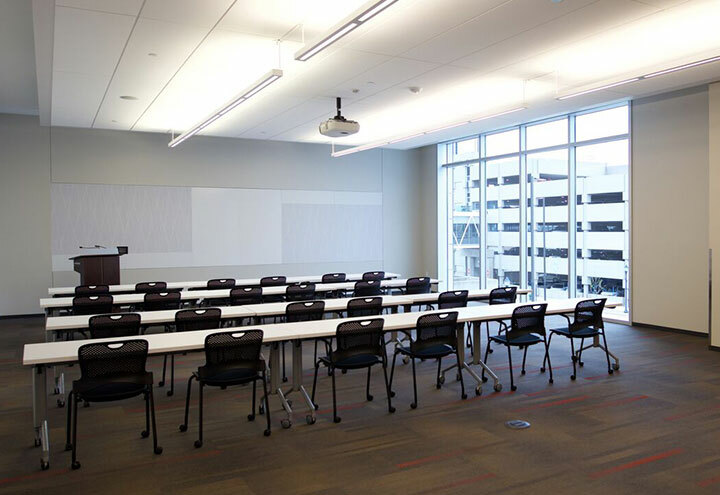 Most meeting rooms include a projector, screen, podium, and microphones. The library does not provide laptop computers for connecting to the projection. It is the customer’s responsibility to verify that the A/V equipment meets his or her needs. The library is not responsible for the sound and video quality of A/V presentations or compatibility with the customer’s equipment or media. If you need to verify the A/V equipment in advance, please call the library to schedule a time. Library staff will show the customer the A/V control system and provide information to operate its components from the control panel (microphones, projectors, screens, DVD player). It is the customer’s responsibility to become familiar with the control panel in order to operate the equipment needed. The library will not operate the equipment during the event unless prior arrangements have been made. A fee will be assessed for this service. What if I require additional assistance with set up? Library staff do not generally assist with the set up or tear down of Library-owned tables and chairs for meetings and events. If you would like them to do set-up or tear-down of tables and chairs for your event, you must let us know at least two weeks in advance. There is a fee assessed for each service. Additional technical assistance is possible but must be planned more than two weeks in advance and there is a fee. For either of these services, please reach out to us at events@crlibrary.org or call the Library at 319.261.7323. May I give out the Library’s telephone number for receiving messages or for information regarding my event? No, the library cannot accept messages for your meeting and library numbers may not be listed for information regarding your meeting. The library requests that all printed materials, press releases, posters, and other information include a contact number for your group. The Library will not promote your meeting through our digital signs or on our website. May my group also schedule a tour of the Downtown Library? Yes, the library will try to accommodate your request for a tour on the day of your meeting; however, tour guides are not always available. Tour requests must be made at least thirty days in advance of the meeting. In the event the library must close due to inclement weather, any meetings scheduled for that day will be canceled. Payment refunds will follow the cancellation policy in the Room Use Guidelines. May I hold a fundraiser at the Cedar Rapids Public Library? In the event the facility is being used for a fundraiser, a fee will be applied to the organization. Can I charge attendees for my event? No private or public meetings charging or collecting admission on the premises will be allowed without express permission. A fee will be applied to the organization. There is no smoking whatsoever on the Library’s property including any interior of the building, the LivingLearning Roof, Urban Plaza, and adjacent areas. Without exception, anyone caught smoking will be asked to leave the premises. How can I hold a space for a wedding or event? Is a deposit required? Is my deposit refundable? If you are interested in holding your wedding or event at the Library, you may place a hold on that date with no deposit required. To firm an event date, a reservation fee of $100 plus a 50% deposit must be paid within two weeks. Reservation fees are non-refundable. Can I hang signs, banners, or decorations in and around the Library? The Cedar Rapids Public Library does not allow the promotion or advertisement of any brand other than the Cedar Rapids Public Library brand. No signs, banners, or promotional materials may be placed in the public areas of the building. This includes the Urban Plaza, sidewalk, or lawn areas of the building, as well as doors. Any products, signs, or promotional material must be displayed or take place solely within the clients rented space (if a public space, after public hours) with the approval of the library. Can I use whatever caterer I wish? The Greyhound Café is the preferred caterer for the Downtown Library. Any food, store-bought or purchased from a caterer, brought in to be consumed by a group with one paying individual, organization or company (any event or wedding which provides food to attendees) must be purchased through the Greyhound Cafe located within the library. To use the caterer of your choice, you must pay a $2 per person fee, up to $250, to Greyhound Café. Am I required to sign a contract and supply insurance? All renting parties for events will be required to sign and comply with a standard facilities use agreement in order to use the Library space(s). In addition, if liquor is served, a Special Event Application listing the caterer holding the liquor license must be processed through the Board of Trustees. Contracts are not negotiable. Various levels of insurance may be required depending upon the nature of the wedding. How do I get permission to take pictures at the Library? Pictures are welcome in the Library but advance notice is required for photo shoots or filming. Please contact the Community Relations Team at least two weeks prior to the date requested. The CRPL reserves the right to decline involvement in any project or photo shoot and to approve any scene/image in which the Library may be featured for promotional purposes. Access to the Library or Library materials must not be blocked for patrons at any time. Fees are based on an hourly rate and can begin as early as 7 a.m. and go no later than 11 p.m. Event setup and cleanup must be included in the reservation time. All parties involved in an event, including DJ’s, caterers, and other outside vendors must be out of the building completely by the end of the reservation time. If an event runs over the time reserved, a fee of double the hourly rate will be charged with a minimum charge of $200. Can other weddings or events take place in the building at the same time as mine? The Library will determine the number of events to be operated simultaneously in the Library, and we do not guarantee you sole use of the Library building except in the location(s) as contracted. What happens if I don't show up for my reserved time? The Library reserves the right to open the space up to the public if the group or person(s) reserving a space has not shown up 30 minutes after the start of the reservation. Please arrive when you have reserved the space.